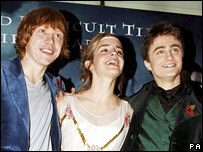 The stars of Harry Potter and the Goblet of Fire have attended the film's world premiere at the Odeon Leicester Square in London. Daniel Radcliffe, who plays Harry, thanked all the fans who had turned up. "If this doesn't get you exhilarated, nothing else will," he told the BBC. Emma Watson, who plays Hermione, said the atmosphere was "amazing and completely overwhelming". The Goblet of Fire is the fourth Potter book to be made into a film. 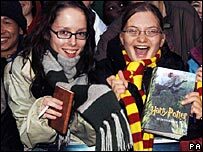 Some Potter fans had waited patiently outside the West End cinema since Saturday night. "There were about 100 people when we got here at 9pm last night and there has been a lot of pushing to get to the front," Romina Talamonti from Argentina told the BBC News website. "We didn't get any sleep at all but I think it will be worth it," she added. Rupert Grint - who plays Harry and Hermione's friend Ron - also attended the premiere. He told the BBC he had enjoyed making all the Potter films: "It's five years now and it's been a long time but they're good fun." Filming on the fifth Potter movie gets under way in February. Grint added that he would "definitely" like to be part of the sixth and seventh films. The cast of the new film includes Ralph Fiennes, Michael Gambon and Dame Maggie Smith. The film has been rated 12A, meaning children under 12 must be accompanied by an adult, due to what classifiers called "more intense scenes". The British Board of Film Classification (BBFC) decided the film contained "moderate fantasy violence, threat and horror". The film sees the boy wizard, played by Radcliffe, mysteriously selected to compete in the prestigious Triwizard Tournament against older students from Hogwarts and two rival schools from Europe. Fiennes plays Harry's nemesis Lord Voldemort, while Miranda Richardson appears as gossip columnist Rita Skeeter. The film also sees Harry get his first love interest in the form of fellow pupil Cho Chang. Emma Watson returns as apprentice witch Hermione Granger while Rupert Grint is back as Ron Weasley. 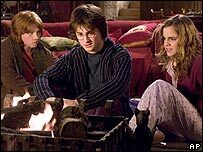 At 157 minutes Goblet of Fire is the second longest Potter film, three minutes shorter than Harry Potter and the Chamber of Secrets. The film, released in the UK on 18 November, has been given a PG-13 rating in the US, signifying it may be inappropriate for pre-teens but it does not restrict children under 13 from admittance. The fifth film, Harry Potter and the Order of the Phoenix, is due out in 2007.